With all of the recent Star Wars TV news it has been very easy for Resistance to appear overshadowed. However, if the series’ first episode is any indication, this show is a worthy of the same hype “The Mandalorian” has. If “The Recruit” has one strength, it is the ability to instantly establish how comfortable it is in its own skin. Right away the episode takes us into a fight between New Republic pilots and a First Order ace. 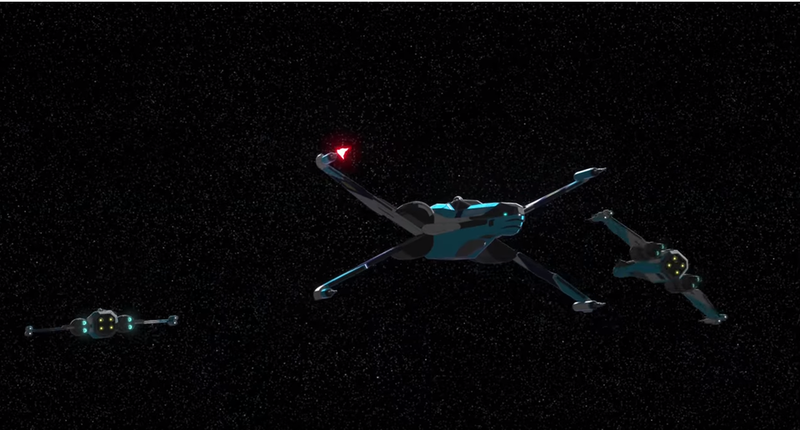 Not only does this give us a great action scene while simultaneously showcasing the reveal of the long awaited T-85 X-wing and First Order TIE Interceptor; it instantly establishes the world we are in. Even the Poe Dameron comic tip-toed at points around the New Republic’s role in the Resistance, but here we get a fantastic look at how the New Republic’s covert management of the Resistance works, as well as the fact that they are not some distant, amorphous, government on the sidelines. This intro action scene also tells the audience right away that this show is going to use dogfighting in a way the films—even the shows, to an extend—rarely have. Poe and Kaz’s fight with Major Vonreg showcases how a one v one (arguably one v one and a half) dogfight works, keeping a constant intensity and making fighter vs fighter action more than just one hit KOs. This makes portraying characterization through combat much easier, such as directors Lee and Ruiz wonderful execution with Poe and Kaz’s interactions and teamwork. This brings us to our protagonist: Kazuda Xiono played by Christopher Sean. Kaz was one element many I have talked to had hesitant opinions about going in but, frankly, I am very impressed with the execution. Introducing Kaz in his element, doing heroics, and being confident in his skills was a great way to show that this guy is a hero in many ways already. I know that many of us have a habit of picking on Ezra, but I think contrasting them here really helps show what makes Kaz appealing thus far. Ezra’s opportunity for change and becoming a part of the action came cause he had nothing and turned out to be something special as a Force sensitive. 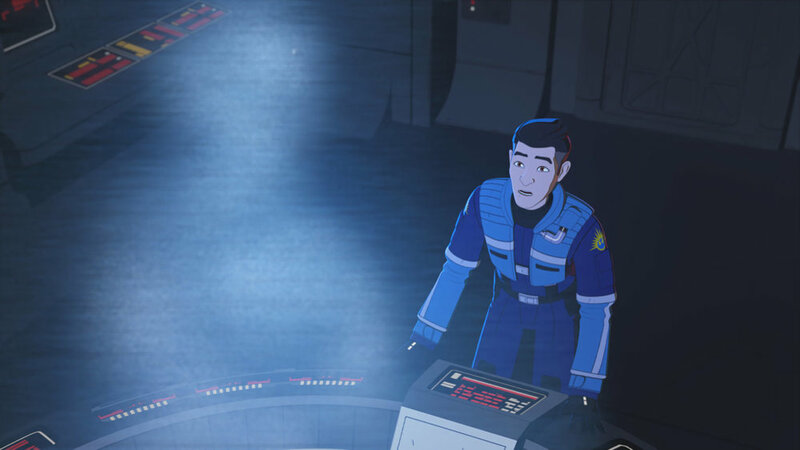 Ezra spends most of Rebels, more or less, trying to find someone to tell him what to do and, while that did make for some genuinely great character moments at points, it was often interrupted cause it took far to long for him to grow beyond his teachers. I adore the symbolism of Kaz looking up at his father, unable to actually see him and vice versa. What sets Kaz apart right away is: he already stands for something. He is a soldier after all. He has a squad, he has squad mates who seem to trust him, and he knows what he is fighting for. He is not looking to Poe and the Resistance to tell him how to be a hero or be a part of something, he is asking them to give him the means to better serve his state. He wants to not just help the Republic through his father’s political string pulling for him, but through serving his duty any way he can. This gives Kazuda a defined and internalized goal right from the get-go. Resistance manages to both show us a great look at the power dynamics between the NR, Resistance, and First Order; while also being a show focused on the micro. The Colossus fueling station is a smorgasbord of different people, droids, and factions, I am excited for this location to be our primary setting for the series, it instantly came alive and really feels like a functioning community. We get naturally introduced to some of the locals, a few establishments, and a couple of the unofficial rules of the place. The Colossus comes alive and feels lived in. The people themselves are also instantly lifelike and feel natural. Team Fireball, in particular Neeku and Yeager, are given a good amount of time to build a dynamic with Kazuda. Neeku is just delightful and could so easily go over the line to annoying, but I kind of love that about him. He walks a thin line which works because the series itself is aware of that danger. Kazuda is the straight man to Neeku’s quirks which prevents them from being obtrusive. Yeager spends most of the episode talking to Poe and perhaps could have had his views on why the First Order is not a threat be expanded; but overall I really enjoyed seeing a burnt out former Rebel. It is fantastic to see that not every Rebel went on to become a part of the New Republic, or keep the fire of the Rebellion alive. Yeager just wants to run his racing team and that’s it. The rest of the cast is not given to many interactions with Kazuda, we establish that Tam is overburdened and very prideful of her handiwork, while Torra is the daughter of the station operator and is very upbeat in a humorously dark way. Which brings me to one of my favorite things about this show thus far: it does not shy away from admitting the stakes of life and death. There are no confirmed deaths in the episode, and yet the First Order really comes off as a true threat to be feared, and the danger of the races and of Grool are so bluntly admitted. I was fully prepared for the series to have little in the way of darkness, which I was on board with; however, they blew me away with some of the dark humor. I think the juxtaposition of the bright colors and everyone being so nonchalant about death makes it work. Kaz’s reactions reflect this. Yes, a fiery death or being eaten by a sea monster is in fact awful, but everyone else being so utterly calm about that fact gives us actual stakes for losing and establishes that death does matter, without having to detract from the fun of the show or get tonal whiplash when the dark moments do come. The final thing I want to commend the series on is the animation. The cell shading look reminds me why I prefer cells, the animation is fluid, the character designs - while stylized - are very expressive, and the anime influence makes me want a Star Wars anime more than ever. I am eager to continue watching Resistance now more than ever, it gives the audience a great mix of Sequel Era world building and power dynamics, mixed with great low-key stakes and great character work.